Nothing, to me, says vintage charm like a cash-only diner. Ritter’s Diner opened in 1951 in Bloomfield and is a family-owned, nostalgic wonderland of home-cooked food. Housed in an unassuming brown-and-gray building at the corner of Baum Boulevard and Powhattan Street, the restaurant is similar to Pamela’s Diner in Oakland by serving comfort food for less than $15. 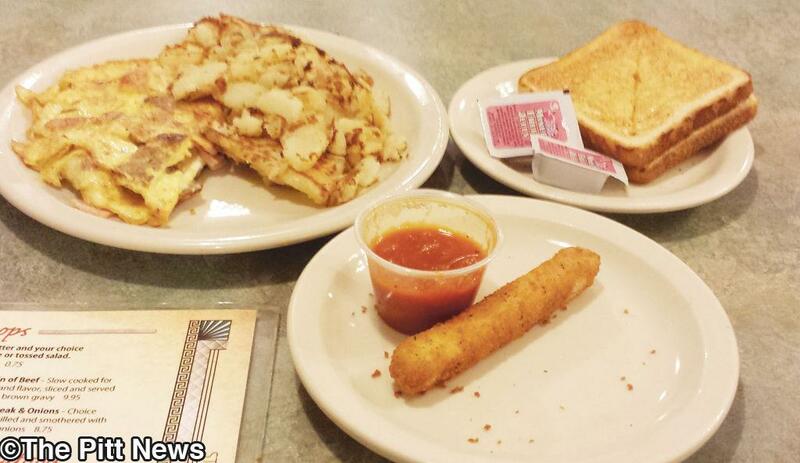 Unlike Pamela’s, Ritter’s goes all night and serves classics like hot roast beef and meatloaf 24/7. With breakfast, lunch and dinner options throughout the day, the restaurant is an amusing, anytime hub for patrons to slide into teal booths, flip through a vintage jukebox and get away from campus restaurants filled with college students discussing classes and recent blackouts. I took a trip down to Ritter’s around 10 p.m. on a Wednesday night that was busier than most, according to the conversation between waitresses I overheard. From my booth near the front of the restaurant, I noticed a group of senior citizens laughing in the back of the restaurant, a couple of old friends catching up and a younger couple on a date. My waitress gave me a menu when I sat down and then fielded my requests for an appetizer of provolone sticks to preface a Meat Lover’s Omelette. With crisp breading and melted cheese, the appetizer was picturesque. The provolone cheese combined with the tang of marinara sauce made for a homey treat. Not too long after finishing my second cheese stick, I received my omelette,which featured bacon, sausage and ham compiled into one delicious ensemble. Every bite burst with savory flavor that overpowered the basic taste of egg. Full, but craving more, I encored my omelette with an order of honey-dipped fried chicken. My waitress brought out the beautiful, golden-crisp skinned chicken, and I took my first bite. The skin was sweet and flavorful and the meat soft and tender, but the chicken lacked any noteworthy flavoring. Nevertheless, it tasted like a home-cooked meal that any college student would look forward to. To complete my feast, I ordered a slice of apple pie. My waitress joked about my slim figure and the amount I was eating. I didn’t expect the slice to be cold, but nonetheless, I devoured the dessert, which was less sweet than I anticipated. Pie is a luxury to be enjoyed whenever the chance presents itself. Ritter’s food is comforting and delicious like other local diners, but the cuisine is only a part of the vintage diner feel. This idyllic restaurant is superior to others in that it’s open all hours of the day and plays with a 1950s aesthetic. For only 50 cents a play, you’ll want to bring your quarters.